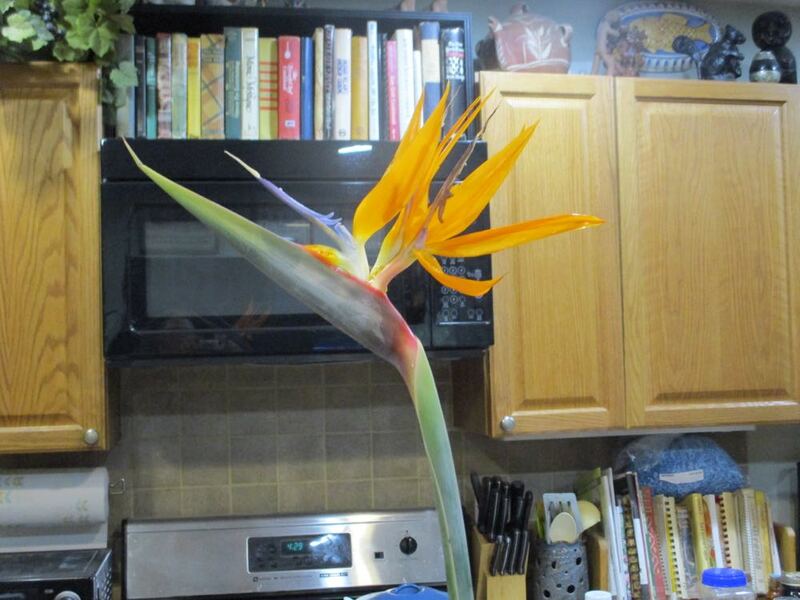 This is a Bird of Paradise flower from a gardening friend who auctioned the plant off. Earlier this year, I bid and won a Bird of Paradise plant, (Strelitzia reginae), also known as crane flowers, one of the most beautiful exotic flowers, from a fellow master gardener. Originally from South Africa, I remember seeing these striking flowers all over Honolulu, Hawaii when I worked there with the US Navy. It can take 5 years before the plant has its first flowers, depending on growing conditions. This was a plant started from seed. The plant I won needs to be cut apart so my gardening friend let me cut off one of the flowers to enjoy. Excited to have this lovely flower home the same week snow was in the forecast, I put it in a flower vase in my kitchen so I could see it while I was bottling honey. One of the rules I have in my kitchen is cats, especially inquisitive, trouble-in-the-making yellow cats, are not allowed on the kitchen counters, including the center kitchen island. When I came back to the kitchen with my camera, guess who I found not only standing on the center island but giving the Bird of Paradise flower a closer look? 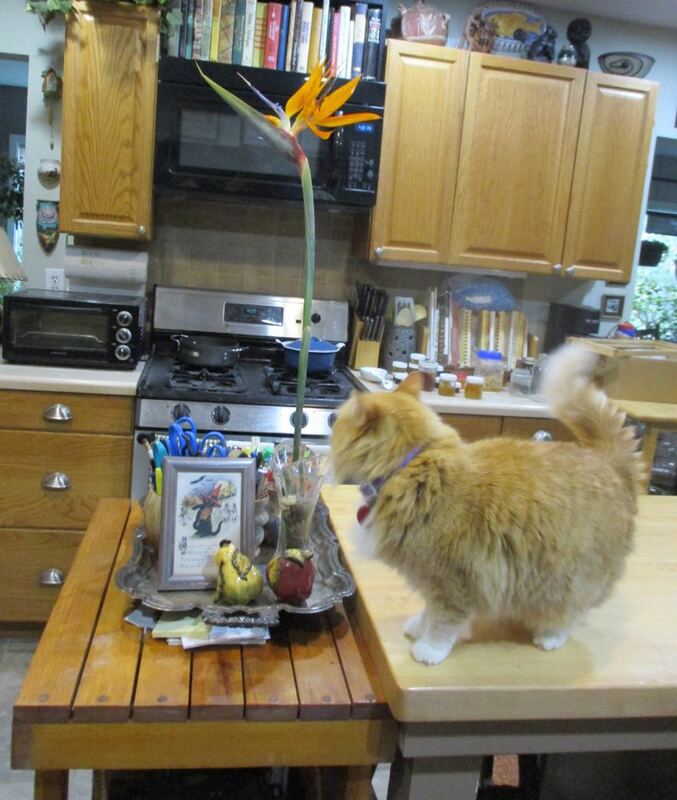 Shirley Honey where she should not be, on the kitchen island getting a closer look at the flower. Shirley Honey likes to watch birds outside my living room window but this is not a good bird-watching spot, even if the flower is called a bird of paradise. After moving her off the counter and finishing my dishes, I found her in her window seat in the den, looking forlorn. She's actually in her favorite spot ready to watch a bird, or lizard, or me go by. This is a cat perch one of my brothers built out of PVC pipes and canvas. I added an old pillow sham for winter warmth for my 18-year old cat but Shirley Honey has claimed this as her favorite sunning spot. 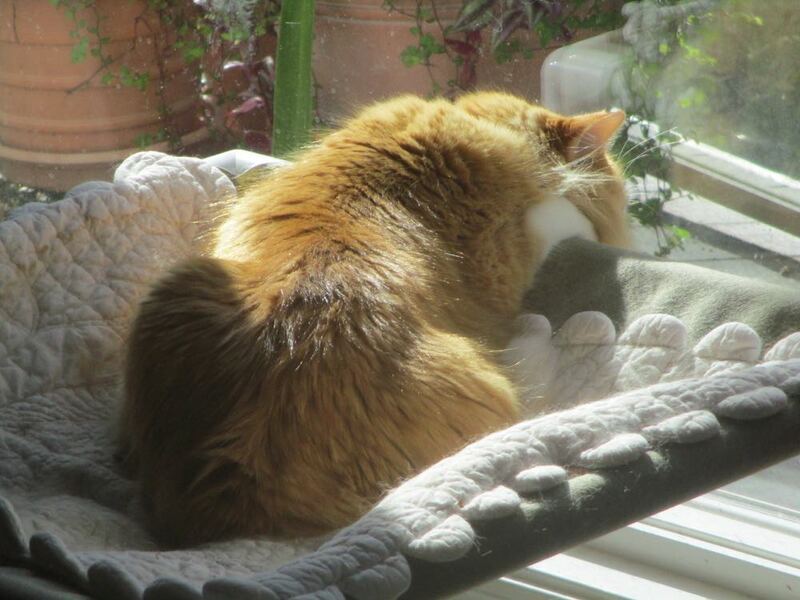 Shirley Honey in her window seat waiting for a lizard, or bird to walk by. Watch for the birdie from there, Shirley Honey! This is Boo Boo before he dashed outside and met up with - well, we're not sure just what! I had no intention of adopting this cat. Someone had dumped him in the Presbyterian Church parking lot, where I saw him for a number of weeks darting under cars early in the morning. Not sure if the local animal control officers tried to catch him or not but he was young and fast so not a surprise if they tried and were not successful. One morning as I was leaving the parking lot, I realized I was the last car parked so I opened the driver's side door to see if I had a cat under my car. Next thing I knew, he had climbed into my car and was sitting on the passenger seat, purring up a storm and so happy to have someone petting him. After a quick vet visit where he got his shots and a check-up, Bartholomew went home with me until I could find him a permanent home. I have lost count of the hundreds of cats that have gone through my house over the years as fosters but there comes a point where one is emotionally exhausted from the constant goodbyes. So Boo Boo Bartholomew Trouble - he earned all of those names - is now a permanent fixture in my house. He still likes to go outside for short walks in the garden with me, checking the flower beds and running back to me in between for some head pats. This particular warm night end of summer, he dashed out the garage door as I was taking out the garbage. I called for several minutes but he didn't come back inside. Every hour or so I would wake up, go outside and walk around my garden calling him. By morning, I thought he was either run over or lost so I made another garden tour calling him. I found him under a bench on the back side of the house, his fur on his scruff missing and one quarter-size area on his right side with fur missing. He was not himself, growling and hiding once I put him back inside. The next day, I had to leave him at the vet for what I thought would be a couple of stitches for the small open spot on his side. The vet guessed Boo Boo must have walked into a raccoon, possum or armadillo that attacked him, there were claw marks on the missing fur spot. When I picked him up the next day, I was startled to find he had stitches down half his side. The vet assistant said once they shaved him, they found several other spots that needed stitching so they cut them out and stitched all of them up in one straight line - Frankenstein cat, as one of my neighbors now calls him. 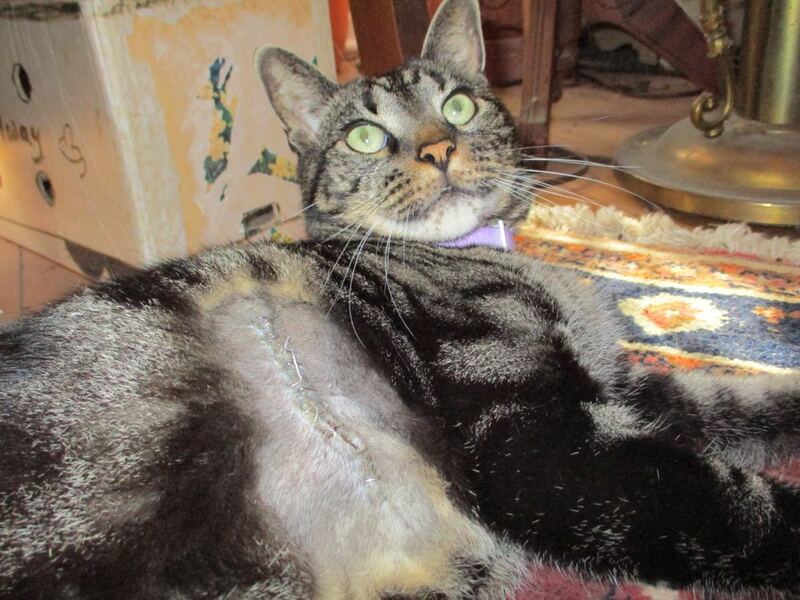 Boo Boo home from the vet looking like two cats stitched together, just in time for Halloween!